This article is about the public life of Bertha Pappenheim. For information on her psychological treatment by Josef Breuer under a pseudonym, see Anna O.
Anna O. "Only a Girl"
Bertha Pappenheim (February 27, 1859 – May 28, 1936) was an Austrian-Jewish feminist, a social pioneer, and the founder of the Jewish Women's Association (Jüdischer Frauenbund). Under the pseudonym Anna O., she was also one of Josef Breuer's best documented patients because of Freud's writing on Breuer's case. 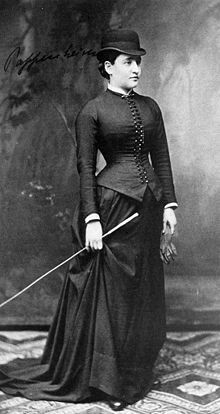 Bertha Pappenheim was born on 27 February 1859 in Vienna, the third daughter of Siegmund Pappenheim and Recha Pappenheim. Her father Sigmund (1824–1881), a merchant, was the son of an Orthodox Jewish family from Preßburg, Austria-Hungary (today's Bratislava, Slovakia), and was the cofounder of the Orthodox Schiffschul in Vienna; the family name alludes to the Franconian town of Pappenheim. Her mother Recha, née Goldschmidt (1830–1905), was from an old and wealthy family in Frankfurt am Main. As "just another daughter" in a strictly traditional Jewish household, Bertha was conscious that her parents would have preferred a male child. Her parents' families held traditional Jewish views on marriage and had roots in Orthodox Judaism. Bertha was raised in the style of well-bred young ladies of good class. She attended a Roman Catholic girls' school and led a life structured by the Jewish holiday calendar and summer vacations in Ischl. When she was eight years old her oldest sister Henriette (1849–1867) died of "galloping consumption." When she was 11 the family moved from Vienna's Leopoldstadt, which was primarily inhabited by poverty-ridden Jews, to Liechtensteinstraße in the Alsergrund. She left school when she was sixteen, devoted herself to needlework and helped her mother with the kosher preparation of their food. Her 18-month-younger brother Wilhelm (1860–1937) was meanwhile attending high school, which made Bertha intensely jealous. Between 1880 and 1882 Bertha Pappenheim was treated by Austrian physician Josef Breuer for a variety of nervous symptoms that appeared when her father suddenly became ill. Breuer kept his then-friend Sigmund Freud abreast of her case, informing his earliest analysis of the origins of hysteria. In November 1888, when she was twenty-nine and after her convalescence, she and her mother moved to Frankfurt am Main. Their family environment was partially Orthodox and partly liberal. In contrast to their life in Vienna they became involved in art and science, and not only in charitable work. The Goldschmidt and Oppenheim families were well known as collectors and patrons of the arts and lent their support to scientific and academic projects, particularly during the founding of Frankfurt University. In this environment, Bertha Pappenheim intensified her literary efforts (her publications began in 1888 and were initially anonymous; they later appeared under the pseudonym "P. Berthold") and became involved in social and political activities. She first worked in a soup kitchen and read aloud in an orphanage for Jewish girls run by the Israelitischer Frauenverein (Israelite Women's Association). In 1895 she was temporarily in charge of the orphanage, and one year later became its official director. During the following 12 years she was able to orient the educational program away from the one and only goal of subsequent marriage to training with a view to vocational independence. In 1895, a plenary meeting of the Allgemeiner Deutscher Frauenverein (ADF) (General German Women's Association) took place in Frankfurt. Pappenheim was a participant and later contributed to the establishment of a local ADF group. In the following years she began—first of all in the journal Ethische Kultur (Ethical Culture)—to publish articles on the subject of women's rights. She also translated Mary Wollstonecraft's "A Vindication of the Rights of Woman." At the first German conference on combating traffic in women held in Frankfurt in October 1902, Bertha Pappenheim and Sara Rabinowitsch were asked to travel to Galicia to investigate the social situation there. In her 1904 report about this trip, which lasted several months, she described the problems that arose from a combination of agrarian backwardness and early industrialization as well as from the collision of Hasidism and Zionism. At a meeting of the International Council of Women held in 1904 in Berlin, it was decided to found a national Jewish women's association. Similar to the Bund Deutscher Frauenvereine (BDF) (Federation of German Women's Associations) co-founded by Helene Lange in 1894, the intent was to unite the social and emancipatory efforts of Jewish women's associations. Bertha Pappenheim was elected the first president of the Jüdischer Frauenbund, JFB (League of Jewish Women) and was its head for 20 years, contributing to its efforts until her death in 1936. The JFB joined the BDF in 1907. Between 1914 and 1924 Pappenheim was on the board of the BDF. On the one hand the goals of the JFB were feminist—strengthening women's rights and advancing the gainful employment of Jewish women—and on the other hand they were in accordance with the traditional goals of Jewish philanthropy—practical charity as a divine precept. Integrating these different objectives was not always easy for Pappenheim. A particular objection was that in her battle against traffic in women she not only spoke openly about Jewish women as victims, but also about Jewish men as perpetrators. She criticized how women were perceived in Judaism, and as a member of the German feminist movement she demanded that the ideal of equal rights for women be realized also within Jewish institutions. She was particularly concerned about education and job equality. A statement she made at the first JFB delegate assembly in 1907 – "under Jewish law a woman is not an individual, not a personality; she is only judged and assessed as a sexual being" – prompted a violent nationwide reaction on the part of Orthodox rabbis and the Jewish press. The existence of the conditions Pappenheim criticized — traffic in women, neglect of illegitimate Jewish orphans — was denied, and she was accused of "insulting Judaism." Also politically liberal and emancipated Jews had a patriarchal and traditional attitude about women's rights. Meanwhile, the JFB grew steadily and in 1907 had 32,000 members in 82 associations. For a time the JFB was the largest charitable Jewish organization with over 50,000 members. In 1917 Bertha Pappenheim called for "an end to the splintering of Jewish welfare work," which helped lead to the founding of the Zentralwohlfahrtsstelle der Juden in Deutschland (Central Welfare Agency of German Jewry), which continues to exist today. Her work on its board was supported by Sidonie Werner. After the Nazis assumed power in 1933 Pappenheim again took over the presidency of the JFB, but resigned in 1934 because she could not abandon her negative attitude to Zionism, despite the existential threat for Jews in Germany, while in the JFP, as among German Jews in general, Zionism was increasingly endorsed after 1933. Especially her attitude toward the immigration of young people to Israel (Youth Aliya) was controversial. She rejected the emigration of children and youths to Palestine while their parents remained in Germany. However, she herself brought a group of orphanage children safely to Great Britain in 1934. And after the antisemitic Nuremberg Laws were passed on 15 September 1935 she changed her mind and argued in favor of the emigration of the Jewish population. After Pappenheim died her JFB positions were partially taken over by Hannah Karminski. In 1939 the League of Jewish Women was disbanded by the Nazis. Bertha Pappenheim was the founder or initiator of many institutions, including kindergartens, community homes and educational institutions. She considered her life's work to be the Neu-Isenburg orphanage for Jewish girls (Mädchenwohnheim Neu-Isenburg). After she gave a speech at the Israelitischer Hilfsverein (Israelite Women's Aid Association) in 1901, a women's group was formed with the goal of coordinating and professionalizing the work of various social initiatives and projects. This group was first a part of the Israelitischer Hilfsverein, but in 1904 became an independent organization, Weibliche Fürsorge (Women's Relief). In contrast to traditional Jewish charities, modern social work should be undertaken, focusing on education and training for an independent life. In accord with the principle of "follow-up aid," former home inhabitants' progress through life was to be monitored for an extended period to avert renewed negligence. The home should not be "an establishment caring for juveniles in the legal sense, no monument in stone to some foundation, with inscriptions, votive tablets, corridors, dormitories and dining halls, an elementary school, a detention room and cells, and a dominating director's family, but rather a home, although it can be only a surrogate for the proper raising of children in their own families, which was preferable." The residents should become involved in Jewish tradition and culture. The home should be kept simple, so that the residents become familiar with the realities and requirements of a lower middle class household. Louise Goldschmidt, a relative of Pappenheim's mother, made available a pair of semi-detached houses where a girl's home could be established in Neu-Isenburg near Frankfurt am Main with all its clinics and social institutions. In contrast to Prussian Frankfurt, Hessian Neu-Isenburg's less rigid laws also had advantages for stateless persons. Thanks to donations amounting to 19,000 marks to furnish the house, it could begin operations on 25 November 1907 with the goal of providing "protection for those needing protection and education for those needing education." The facility was plain, and was sometimes criticized for being excessively so. There was, for example, no running water in the bathrooms and central heating was only added in 1920. But the facilities did make it possible to strictly adhere to Jewish dietary and purity requirements, (kashruth, kosher). In the basement a passover kitchen was even available, although it was required only once a year. Art in the house and garden was to serve to educate the residents. Examples are the children's fountain, Der vertriebene Storch (The Expelled Stork) designed by Fritz J. Kormis to illustrate a tale by Pappenheim, lecture series, modest theater performances, and speeches, among others by Martin Buber, a friend of Pappenheim and a guest on several occasions. The number of residents was initially low, but grew in the course of time from 10 in 1908 to 152 in 1928. The property and existing buildings were expanded with purchases and donations and adapted to meet increasing requirements, and additional buildings were constructed. In the end the home consisted of four buildings, including one for pregnant women and those who had just given birth—the delivery itself took place in a Frankfurt clinic—and an isolation ward. The home's school-aged children attended the Neu-Isenburg elementary school. There was extensive medical care for the residents, and at regular intervals psychiatric examinations. Pappenheim rejected psychoanalytic treatment for the residents. She herself only spoke once about psychoanalysis in general: "Psychoanalysis is in the hands of a doctor what confession is in the hands of a Catholic priest; whether it becomes a good instrument or a double edged sword depends on who is administering it and on the treatment." Since the ongoing financing of the home was preferably not to depend on rich individual patrons, an association, the Heim des jüdischen Frauenbundes e.V. (Home of the Jewish Women's Association), was established to act as its sponsor and owner. Membership fees of 3 marks per year were supposed to put the covering of running expenses on a broad basis. Appreciation for her Neu-Isenburg work was not at first forthcoming for Bertha Pappenheim. Orthodox Jewish circles considered the founding of the home to be a scandal, and its existence a tacit toleration of prostitution and immorality. In order to reintegrate into the Jewish community single mothers, young prostitutes and their children, who in most cases had been disowned by their families, the home attempted to motivate families to resume relations with them, and known fathers to marry the mothers of their children or pay alimony. After her mother died in 1905 Bertha Pappenheim lived alone for many years without a private attachment. "Mir ward die Liebe nicht" ("Love did not come to me"), she lamented in a poem dated 1911. In May 1923, she was one of the principal speakers at the First World Congress of Jewish Women in Vienna, where she spoke on the need to protect Jewish girls and women from trafficking and prostitution. In 1924 a close friendship began with Hannah Karminski, a woman 40 years her junior, when Hannah took over the leadership of the Jüdischer Mädchenclub (Jewish Girl's Club). Both women spent their free time together as much as possible. When in 1925 Karminski moved for a time to Berlin, they wrote to each other almost daily. While on a trip in Austria in 1935, she donated two of her collections (lace and small cast iron objects) to the Museum of Applied Arts in Vienna. From Vienna she traveled on to Ischl. While traveling her general condition deteriorated and she was taken to the Israelite Hospital in Munich. During an operation which took place there it was determined that she had a malignant tumor. Despite her illness she traveled, at the end of 1935, to Amsterdam in order to meet Henrietta Szold, the head of Youth Aliyah, and again to Galicia, to advise the Beth Jacob Schools. After returning to Frankfurt her suffering increased and she became bedridden. She also had jaundice. During her last few days of life, she was summoned for questioning by the state police station in Offenbach, the reason being denunciation by an employee of the home. A girl with an intellectual disability had made what was considered by the police to be a derogatory comment about Adolf Hitler. Pappenheim refused to appear at the hearing because of poor health. After the hearing on 16 April 1936, for which she calmly but firmly supplied information regarding the accusation, no further steps were taken on the part of the police. She died on 28 May 1936, cared for until the end by her friend Hannah Karminski, and was buried next to her mother in the Rat Beil Strasse Jewish cemetery in Frankfurt. After the death of Bertha Pappenheim the work in Neu-Isenburg could continue essentially unhindered until the 1936 Olympic Games. In 1937, the children residing in the home were no longer allowed to attend the Neu-Isenburg elementary school and had to be transported daily to the Jewish school in Frankfurt. In 1938 the Isenburg branch of the NSDAP instigated the closure of the home. On 10 November 1938, one day after the November Pogrom (Reichskristallnacht), the home was attacked. The main building was set afire and burned down, and the other buildings were wrecked. On 31 March 1942 the home was disbanded by the Gestapo. The remaining residents were deported to the concentration camp in Theresienstadt, where many died. On 9 December 1942 Hannah Karminski was brought to the extermination camp in Auschwitz-Birkenau where she was murdered on 4 June 1943. Bertha Pappenheim published her first works anonymously, and later under a pseudonym, "Paul Berthold," still a common practice among female writers of that time. She derived the pseudonym by modifying her own name: „Berth(a) Pappenheim“ became „P(aul) Berth(old).“ Starting in 1902 she published novellas and plays under her own name. Kleine Geschichten für Kinder (Little Stories for Children) appeared anonymously in 1888, to be followed in 1890 by a volume of tales, In der Trödelbude (In the Junk Shop). The nine novella in this volume have as their subject in each case a defective or otherwise useless item, such as a piece of lace, a music box, or a coffee pot. In 1913 she published the play Tragische Momente. Drei Lebensbilder (Tragic Moments. Three Scenes from Life). The scenes correspond to three episodes in the life of a Jewish couple. In the first scene the young couple experiences the atrocities of the Russian pogroms of 1904 and flees to Frankfurt. In the second scene, as Russian Jews they are not accepted in the community. A Jewish innkeeper wants to employ the woman as a hostess and the man as a trickster. When they turn down his offer, he denounces them as political criminals and they flee to Palestine. The third scene shows the man as a widower waiting for his son to return from Europe. When the son confesses that he cannot imagine a life as a farmer in Palestine, his father commits suicide. Pappenheim refused to have the play performed at a JFP assembly of delegates in 1933, "since the 'Tragic Moments', which I wrote without an ulterior motive, would certainly give rise to objections in Zionist circles because of their timeliness." She advised against "scattering explosives among the women." In addition she wrote numerous texts unpublished during her lifetime. Most are lost and what remains is scattered. Among the scattered texts are the so-called Denkzettel ("Memoranda"), short maxims and sayings, some of which are dated and some of which she later had her secretary Lucy Jourdan collect and copy. An example: "Whoever foregoes his freedom without an urgent necessity does not deserve it." These texts also include the prayers which were published by the League of Jewish Women shortly after Pappenheim's death. These are not prayers in the sense of traditional Judaism, but personal poems addressed to God. In a cellar, without light. Whose bow has been broken. Living myself sore from duty. One of her first productions was a translation of Mary Wollstonecraft's programmatic paper in English on the women's rights movement. It appeared in 1899 under the title Mary Wollstonecraft – Eine Verteidigung der Rechte der Frau (Mary Wollstonecroft — in defense of women's rights). Parts of Ze'enah u-Re'enah, the so-called "Women's Bible." Only the first part of her translation of the Women's Bible appeared (Bereschit, correspondending to the First Book of Moses). The translations of the Second and Third Books (Schemot and Wajikra) have apparently been lost. Putting the text into modern language and punctuation has the purpose of reanimating the image of a woman who, deeply rooted in her times, stands out because of her unusual intellectual gifts, and is true to her faith, true to her people, true to her family, and true to herself. In the hands of parents, educators and teachers the Allerlei Geschichten (All Kinds of Stories) can be a bridge to a new understanding of the meaning of traditional Jewish culture and beliefs. Together with her brother Wilhelm and Stefan Meyer, a relative, she found out while researching her family tree that she was distantly related to Glikl. She also had Leopold Pilichowski (1869–1933) make a portrait of her as Glikl. German postage stamp (1954) in the series "Benefactors of Mankind"
The focus of her writings, however, was to provide information especially about the social situation of Jewish refugees and traffic in women. In 1924 she published her most well-known book, Sisyphus-Arbeit (Sisyphean Labor), a study on traffic in women and prostitution in Eastern Europe and the Orient. In 1954 a German postage stamp with a portrait of Bertha Pappenheim was issued in the series "Benefactors of Mankind" in recognition of her services. On the 50th anniversary of her death, a conference was held on various aspects of her life. On the former site of the Neu Isenburg home for endangered girls and unwed mothers, a seminar room and memorial to Bertha Pappenheim were inaugurated in 1997. ^ Kaplan, Marion (1979). The Jewish Feminist Movement in Germany. Westport, CT: Greenwood Press. pp. 29–40. ^ Jensen, Ellen M. (1984). Streifzüge durch das Leben von Anna O./Bertha Pappenheim: Ein Fall für die Psychiatrie – Ein Leben für die Philanthropie. Frankfurt am Main: ZTV Verlag. p. 19. According to Jensen, the family's second daughter died at two years of age in 1855, four years before Bertha was born. ^ Jensen (1984), Streifzüge, p. 21. ^ For example, the Katharina und Moritz Oppenheimsche Stiftung established a chair of theoretical physics at Frankfurt University, and Marcus M. Goldschmidt was a member and patron of the Senckenbergische Naturforschende Gesellschaft. ^ Pappenheim, "Zur Sittlichkeitsfrage." In: Helga Heubach (ed. ), Sisyphus: Gegen den Mädchenhandel – Galizien. Freiburg im Breisgau: Kore, 1992. p. 112. Original German: "vor dem jüdischen Gesetz ist die Frau kein Individuum, keine Persönlichkeit, nur als Gattin und Mutter wird sie gewertet und beurteilt." ^ Pappenheim, Bertha. Aus der Arbeit des Heims des Jüdischen Frauenbundes in Isenburg 1914–1924. [edition needed] p. 8. ^ Pappenheim, Aus der Arbeit, p. 5. ^ Cited in: Loentz, Elizabeth (2007). Let Me Continue to Speak the Truth: Bertha Pappenheim as Author and Activist. Cincinnati: Hebrew Union College Press. p. 219. ^ Gürtler, Christa. "Bertha Pappenheim: Soziale Arbeit, Frauenbewegung, Religion" (in German). Literaturhaus Wien. Retrieved 23 November 2018. ^ Seminar- und Gedenkstätte Bertha Pappenheim. "Schenkung Bertha Pappenheim Seminar- und Gedenkstätte: Thora-Zeiger im Andenken an Anni Salinger" [press release] (January 13, 2012). Retrieved from http://neu-isenburg.de/buergerservice/rathauspresse/archiv-pressemitteilungen/ 2015-08-28. The collections were initially permanent loans of the Siegmund- und Recha-Pappenheim Stiftung, and later came into the possession of the museum as donations. ^ Leitner, Thea (1998). Fürstin, Dame, Armes Weib. Ungewöhnliche Frauen im Wien der Jahrhundertwende. Vienna: Ueberreuter. p. 349. ^ Based on the Gesetz gegen die Überfüllung deutscher Schulen und Hochschulen (law against overcrowding in German schools and universities) of 25 April 1933. ^ "Central DB of Shoah Victims' Names". Retrieved 20 Feb 2017. ^ Jensen (1984), Streifzüge, p. 43 f.
^ Bertha Pappenheim to Frau Clem Cramer, dated Isenburg, January 1933. Stadtarchiv Frankfurt (Frankfurt Municipal Archive). Among the lost texts were apparently two other plays mentioned in this letter. Their titles are Ostern ("Easter") and Das Gesindel ("The Rabble"). ^ Jensen (1984), Streifzüge, p. 179–195. ^ Stadtarchiv Frankfurt. Nachlass Dora Edinger. Blatt II. (Frankfurt Municipal Archive. Estate of Dora Edinger. Sheet II). ^ Memoiren der Glückel von Hameln (2005). Weinheim: Beltz. p. IX. ^ Brentzel, Marianna (2014). Anna O. - Bertha Pappenheim: Biographie. Göttingen: Wallstein Verlag. p. 248. ^ Magistrat der Stadt Neu-Isenburg. "Zur Eröffnung der Seminar- und Gedenkstätte" [press release][date missing]. Bertha Pappenheim Collection. ; AR 331; Leo Baeck Institute, New York, NY. This page was last edited on 15 March 2019, at 22:55 (UTC).